Wirelessly manage your Android Phone through your PC. 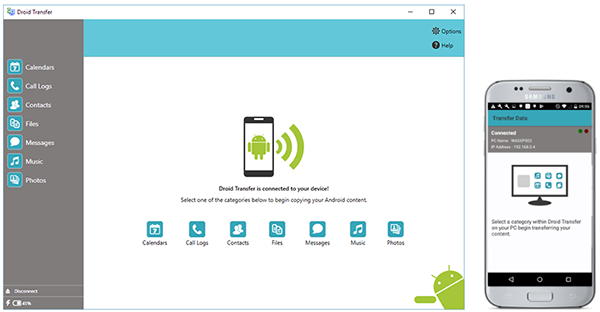 Droid Transfer allows you to copy photos to your PC, sync iTunes to Android, save and print your messages, and much more. 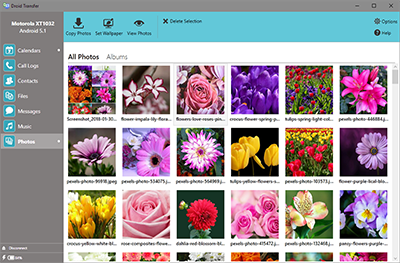 Hit 'Copy Photos' to copy all photos, or make a selection first to copy only selected photos. Select a location to save to and click 'OK'. View, Copy or Delete photos from your Android device. Droid Transfer gives you the ability to copy photos from your Android Phone to your Computer. Manage photos on your Android device by using Droid Transfer's intuitive and easy to use interface. 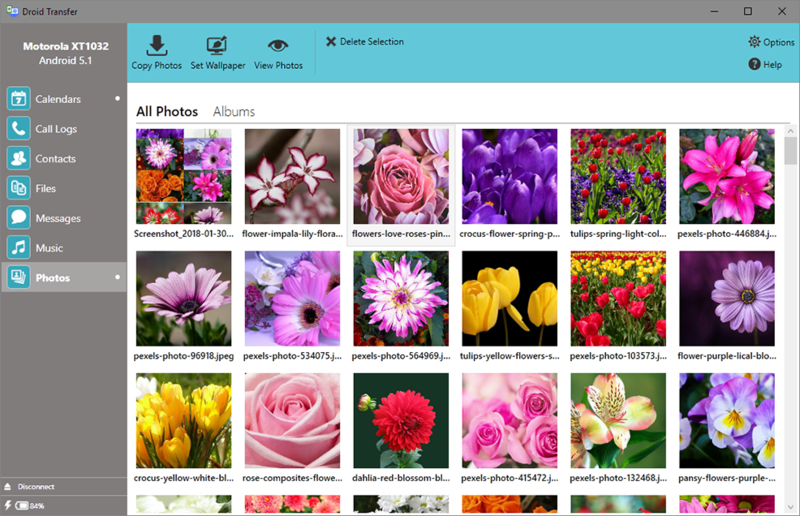 View your phone's photo collection, and copy photos and albums to your pc for safekeeping. You can also delete photos from your Android phone from directly within the application, or set your favorite photo as your computer's background wallpaper! Droid Transfer will manage and backup your Android device over a WiFi, or a USB connection! Droid Transfer works alongside a free Android Application, Transfer Companion, enabling you to manage and transfer content on your Android device through your local WiFi network. Transfer Companion is a free App available for download from the Google Play App Store. For instructions on setting up Droid Transfer, please see our Quick Start Guide. Try our other product, TouchCopy, for copying Messages, Music and other media from an iPhone, iPod or iPad device to your PC or Mac.